Whatever happened to the notion that reading expands your mind? That reading helps you see the world through a new set of eyes? That reading, whether fiction or nonfiction, makes you a well-rounded human being? It seems to have disappeared, swallowed by Common Core, test prep, and scores that determine the fate of every child. Now reading is to cram as much as knowledge into your head only so you can regurgitate it onto a test. Shove it all in there by memorization, who cares about deeper connections or questions to ponder? Just read, read, read, read and please make it nonfiction so that it is all facts, more knowledge, more things to know so that we can test you on it. After all, facts is what makes a great problem solver, right? I hate the bastardization of reading that is happening here. I hate how reading becomes quantified through logs, broken down into data pieces, smothered through a heavy-handed focus on nonfiction rather than just reading. Reading for the love of it. Reading for the sake of it. Reading for the joy of it. I hope Scholastic comes out with a catalogue that says, “Parents: Reading leads to new adventures!” or “Parents: Reading can be an escape for your child!” Or “Parents: Reading will deepen your child’s creativity!” Somehow I am not sure that will happen anytime soon, but we must hope, and we must fight. Our love of reading depends on it. PS: As it was mentioned in the comments, look at what they highlight as great nonfiction reading: An encyclopedia, a math dictionary, a spelling handbook, and a world atlas. Couldn’t they at least have highlighted some great nonfiction books like “Bomb” or “Lincoln’s Killers” which I know they sell? 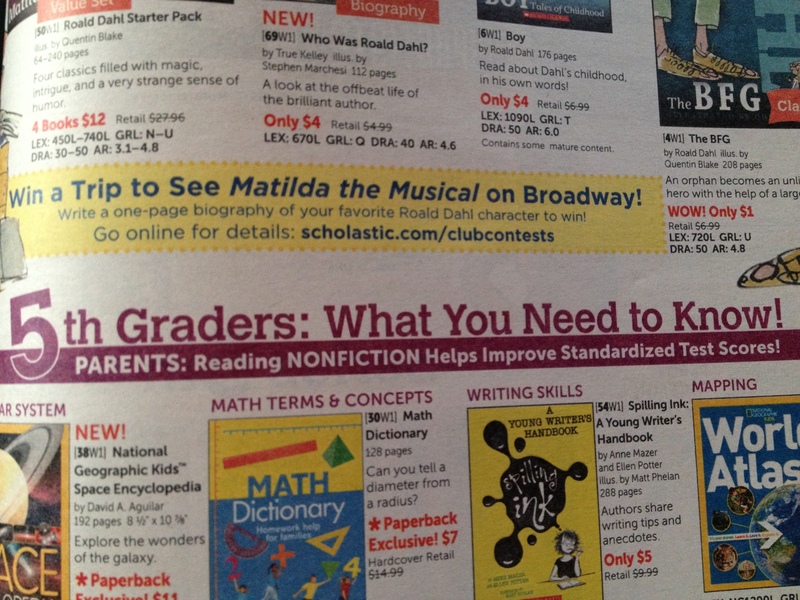 Next postDear Scholastic, What’s Up With the Leveled Catalogues? Yikes! I couldn’t agree more. Not to mention… those options are awful. A math dictionary is NEVER going to instill a love of reading. There are WAY more engaging non-fiction texts out there! I totally agree! It’s kinda scary! Commercialization is such a problem. B & N does the same thing with their displays. Who is in charge of marketing? Obviously not a teacher, and definitely not someone who has children and grandchildren of their own! Thanks for such a great blog post! Bah humbug – Scholastic sales! Totally agree with you about commercialization. If reading is hyped us as a commodity, then there’s a whole lot of hubbub about reading and not so much actual reading! Well said! Great timing as we contemplate how we’ll embrace a new school year. How can a dictionary count as “reading”? This is heartbreaking. I can’t exalt the power of non-fiction. I read mostly military non-fiction and history type books. I have to admit, most of it is dry. I watch book tv looking for good non-fiction and find it is mostly non-existent now. So, I read historical fiction and look up what catches my eye in my encyclopedias. I am also one of the biggest critics of those standardized tests! I detest them. Kids graduate high school now and can’t remember what they learned because they didn’t “learn” it! They memorized it, passed the test, then forgot it! Colleges are making fortunes off the remedial classes these kids need to take to “relearn” what they’ve forgotten. When I was younger I would read book on how to write by science fiction authors. They all said if you write science fiction your science has to be based on hard facts because your readers will check them. 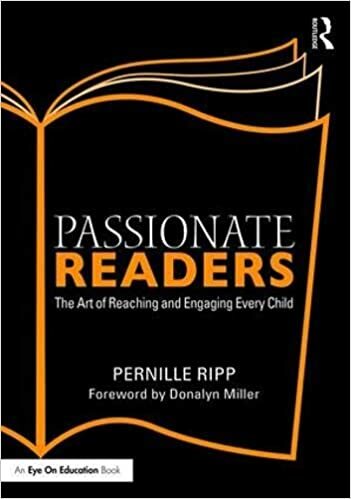 See when we read we don’t want to learn about what we already know, we want to read about the possibilities, the dreams, the maybes, might haves, and could bes. I don’t think anyone thinks it eliminates fiction, but it does put a disproportionate amount of attention on nonfiction when most students already get a lot of nonfiction through social studies and science. This post is to lament the fact that they are saying reading improves standardized test scores rather than highlight the incredible things reading can do for you. Exactly. The scariest thing is not the suggestion of non relevant nonfiction books, but the slogan itself: to improve standardized test scores…! I taught 3rd and 4th grade for a good number of years, and I adored teaching reading, writing and all of the language arts. We had fun with words, made connections between subject areas, and laughed and cried with our book characters. We read and read and read, and we wrote and wrote and wrote. The students shared passages that “spoke” to them and shared their writings with pride and confidence. We created. We learned. We developed a love for stories and for using our senses to communicate with others orally and on paper. Fiction, non-fiction, biographies, fairy tales, poetry, songs, pen pals, journals… all of it for the fun and joy of creating a vivid visual image and for creating meaningful memories. Not once was the purpose focused on testing or grades. When I became a teacher, I made a vow to myself. I vowed to never teach reading and writing the way I was taught. The endless reading requirements, the book reports; it all killed a joy of reading and writing that was buried deep inside me–a joy that I didn’t discover until I was an adult! I am proud to have never, ever assigned a book report. We always went about studying a piece of literature in ways that tapped the students’ creative desires as best we could. It never seemed like “work.” I tried to make whatever we did a natural extension of trying to understand, expand, or extend an idea. When I saw your title and that it was about the Scholastic Book Club, I thought maybe your post would be about the fact that they are identifying almost everything by grade level. We are eroding students’ opportunities to have some choices in what they read. I have heard some grumblings about the grade levels other places. What if a 6th or 7th grader likes what’s labeled “5th grade”. I used to give my 5-8 students access to the Arrow and Tab books. The nail has been hit fairly and squarely on the head, well said and well done. What we ‘should’ read is very different from what we want to read, and No-one else can tell us what we want to read. After 53 years of teaching, I just shake my head when I watch what American education is going through. How can we think that we are preparing kids for success in the world they will find themselves in? Good post, Pernille. So glad people like you are still in the classroom. I, too, wish there would be some better catalogue themes. How else are we going to get excited about reading so they’ll want to read for the rest of their lives? Love it! And who says fiction doesn’t lead to problem solving? My teens are going to know how to defeat the zombie plague, avoid treacherous adults that want to use them for evil plots in the future, and how to survive on a can of peas after an asteroid destroys the moon. Tell me that’s not problem solving. I totally agree. We love good non-fiction books because they bring you to a different time or show you how amazing science can be. Test scores?!? This is what one of the many things wrong with how people view education these days. Not only that, but now a number of scholastic books are only available as storia ebooks through their catalogs and online. I don’t want my child reading ebooks. Kids should be reading a real book that they can hold in their hands and then loan to one of their friends to read. I love the discounts we get through Scholastic, but that’s not the way to get books into the hands of our kids. Because you are the passionate, dedicated reader and learner that you are, you noticed this abhorent ‘ad’ and brought it to our attention. Thank you for blogging about it and recognizing the power of words to undermine or uplift reading. I am curious… what are some ways you’ll share this same conversation with your students? 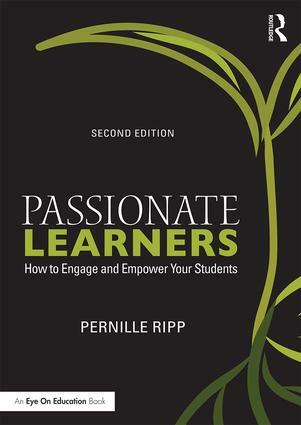 Passionate reflection on how we promote the love of reading, especially nonfiction. Every once in a great while, your child may be lucky enough to be in the classroom of a really wonderful Language Arts teacher. For my twelve year old, that teacher was Mrs. Maryann Cassidy. She taught my daughter, a speed reader with a crazy-high Lexile score, to slow down, enjoy the book, picture the descriptions, and still seek knowledge. My daughter still counts Mrs. Cassidy as one of her all-time favorite teachers! Without sounding “old school” I do agree with this article to some degree. I think it basically comes down to, too much of anything is no good.” A happy medium is best.